The history and archaeology of Maryland's first capital, St. Mary's City. Written by Silas D. Hurry. Almost four centuries ago, a group of some 140 English men and women crossed the Atlantic to settle Lord Baltimore's new colony on the shores of the Chesapeake Bay. The town they carved out of the wilderness, St. Mary's City, became Maryland's first capital, a center of commerce, and a proving ground for ideas that helped to shape American democracy. Today, archaeologists and historians are uncovering the secrets of the colonial past at this buried city. The town lands have been designated a National Historic Landmark and are among the most significant historical archaeology sites in the nation. Stains in the soil, bits of brick, and scraps of metal describe long-vanished buildings. Buried household objects and personal possessions suggest the aspirations, changing fortunes, and day-to-day lives of the colonists. Surviving wills, court records, and inventories connect individuals to the larger experience of their community. As they come to light in our time, these puzzle pieces portray the history of a place marked by opportunity and disappointment, struggle and success, idealism and compromise. 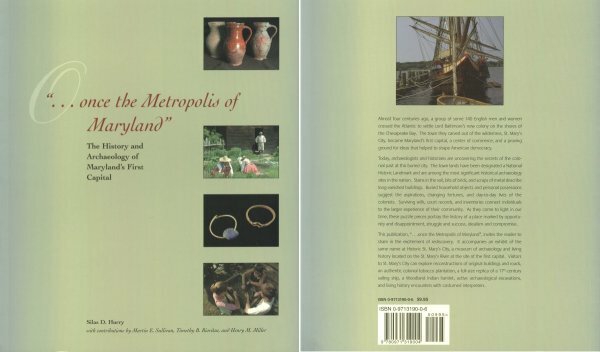 This publication, ��once the Metropolis of Maryland�, invites the reader to share in the excitement of rediscovery. It accompanies an exhibit of the same name at Historic St. Mary's City, a museum of archaeology and living history located on the St. Mary's River at the site of the first capital. Visitors to St. Mary's City can explore reconstructions of original buildings and roads, an authentic colonial tobacco plantation, a full-size replica of a 17th-century sailing ship, a Woodland Indian hamlet, active archaeological excavations, and living history encounters with costumed interpreters.